Rear is NOS and spaced at 125mm. 384g total weight. Rear is 238g, front is 136g. Miche is a historic Italian bicycle component manufacturer. Miche started in 1936, when Ferdinando Michelin changed his business from being a bicycle manufacturer (started in 1909) to a company that specializes in development of components. Wayne Bingham, 2017: "I talked with some people at Miche. 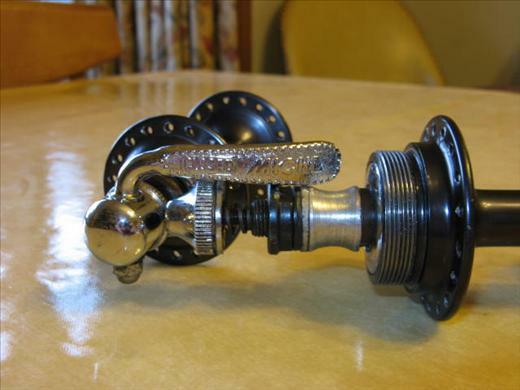 I was told by Miche that they have, since their earliest days, made their own hubs, cranks, BBs, chainrings, cogs, seatposts, headsets (many of which used the same roller bearings used in Stronglight headsets) and some other items. They never made bearings, derailleurs, shifters, etc., and still don't. They stopped selling headsets when they stopped production of their last 1" threaded and unthreaded roller bearing headsets."